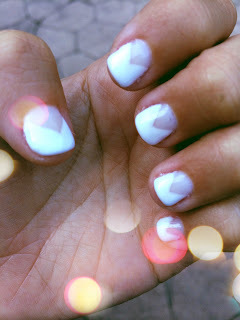 Thought I'd share my most recent [and interesting] manicure with you! A few weeks ago I got my first full set of acrylic nails since probably prom in 2010. I went with almond shape // short stiletto nails with a mauve, Kylie-esque, look using OPI Don't Bossa Nova Me Around from their Brazil Collection. The length was a little too long for my own comfort, but I got used to it. As soon as I got used to it, they grew longer and longer - and next thing I know, I'm WAY overdue for my next fill. This time around, I wanted something a little more natural and not so much on the flat polish side. I had them filed them down to a much shorter length and thinned the acrylic, giving me a much more MNBB (My Nails But Better) look. 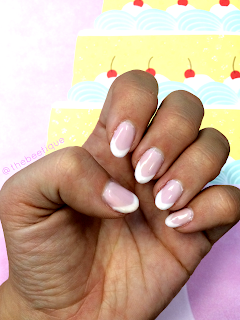 To top it off, my nail tech used white to airbrush the tips of my nails, then used a baby pink to airbrush my cuticles. The airbrushing technique made the most perfect gradual ombre effect.